by Melody Miller and Allison Tannery. 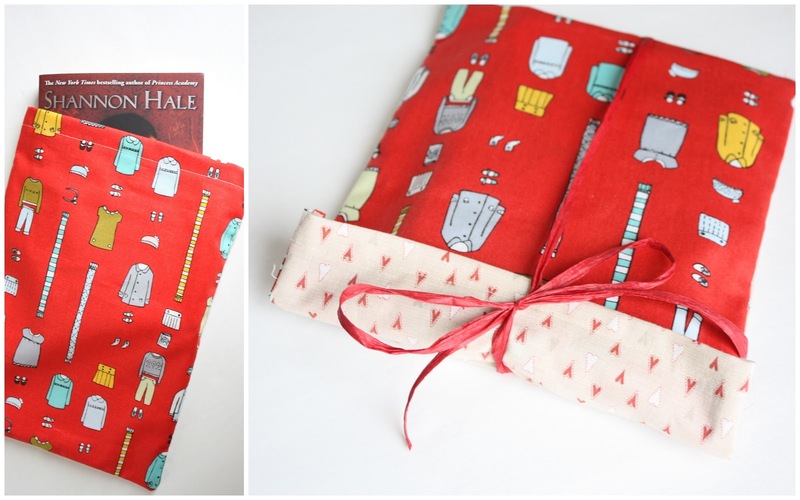 The book is full of creative ideas for making attractive, resourceful and reusable wrapping and packing options using things you already have including fabric, trims, etc. I received a copy of Ruby Star wrapping at the Sewing Summit this fall and have been antsy to try a few projects ever since. The pictures in the book are beautifully shot and full of lots of creative inspiration. 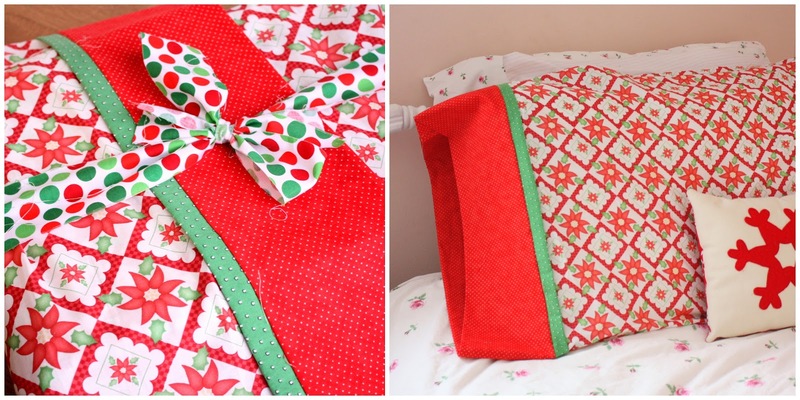 I have been making present-wrapping using the Pillowcase Pouch pattern. We tend to give and receive a lot of books at our house so this felt like a simple way to create packaging that we can reuse year after year. And it looks pretty. 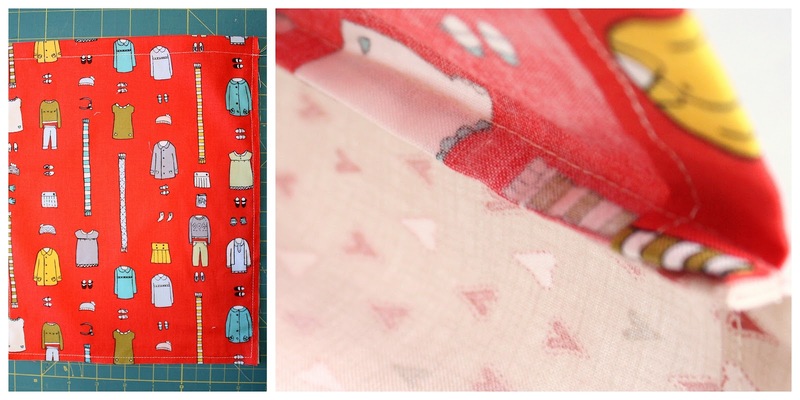 I couldn’t resist using Melody Miller’s adorable typewriters to create a simple pocket for a card or note. Pillowcase construction is so easy. I made mine with french seams (where the seam allowance is enclosed) to make the appearance a little tidier and to keep the inside seams from fraying and looking ratty. Basically I sewed the pieces together wrong sides together first, then turned inside out and sewed 3/8″ seams with the fabrics right sides together, encasing the raw edges. Very slick. To see other projects and ideas from Ruby Star Wrapping visit these other stops on the tour. 11.23.12 Sukie of Sukie – don’t you know who I am? You can also visit Sukie to enter your projects for a chance at other cool prizes, like a Gelaskin $40 gift certificate an a $20 gift certificate to Pink Chalk Fabric! So now is your chance to create some quick and pretty reusable gift wrap just in time for Christmas and be able to enter to your project to win awesome prizes. Total win-win! These look great, I really need to dig my copy out to decide how I&#39;m wrapping my family gifts for this year! Very cool! I need to try this! Cute little pouches Amy!! Who gets the Shannon Hale book and which one is it?? I love Shannon Hale&#39;s books 🙂 Hope you are having a very Merry Christmas!! Such a great idea! I think i&#39;ll go try some now! These a so sweet. Might haveto try for upcoming birthdays…maxed out for Christmas, lol! Aww, I love them. So smart to make one an actual pillowcase size too! These are great! I&#39;m going to try a french seam next time for sure!